Every October, in the canyon along the Fryingpan River, pumpkins appear. Some show up along the road. Others appear on rocks in the river. A few pumpkins even hang from trees. These bright spots of orange are a nice sight to look at while you stroll the river for some fall fishing. 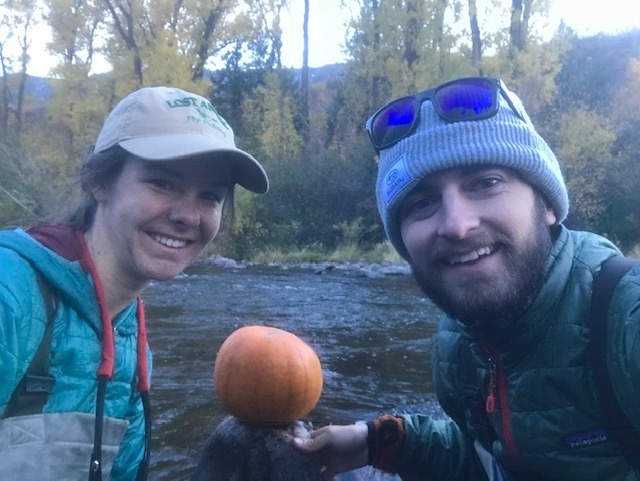 For the past few years, we have hit the canyon in October to chase trout, spot pumpkins, and place a few pumpkins of our own. We like to find fun spots to put them. There’s always a rock or tree that forms a pocket that holds fish. These spots usually get a pumpkin. We also usually put some tiny ones along the road in clever locations for people to spot as they drive the canyon. A choice rock gets a pumpkin. We had two days of fishing and pumpkin-placing on the Pan. Saturday was set to be in the 50s with sunshine. Sunday, on the other hand, had a forecasted high around freezing, lows in the teens, and snow. Even on the warmer October days in the canyon, it takes a while for things to warm up. While we’d usually be on the water by 7 in the summer, at this time of year we like to take our time in the morning. The sun didn’t peek over the canyon walls until after 10, which is right around the time we showed up. It was clear that everyone else had seen the forecast, too, as we were competing with quite a few people for spots. 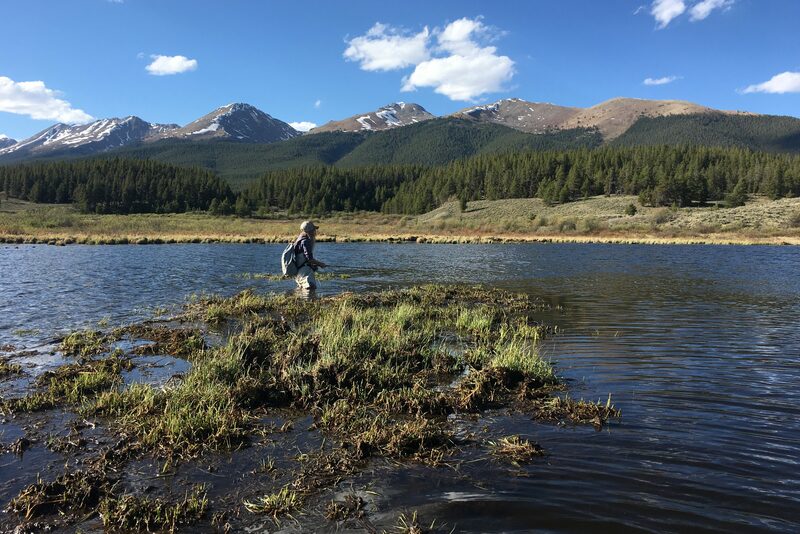 We arrived rigged for streamer fishing, but after 5 minutes and multiple rises in our run, we quickly scrapped that plan and threw on dries. After landing a couple fish, the rises started to get hectic. It looked like rain on the water in calm spots, but the fish also got picky. The frustrating kind of picky where you’re seeing multiple rises at a time but no one seems to want what you’re throwing. We see this a lot on the Fryingpan. The quickest way to fix it is usually not to switch what you’re doing. It’s to switch where you’re doing it. A 5 minute drive down the road took us to fish who were more than happy to take what we’d been throwing. Here, they weren’t picky. BWOs, caddises, PMDs, and streamers were all on the menu. Another thing I notice about fall on the Fryingpan is the difference in fish we seem to encounter. 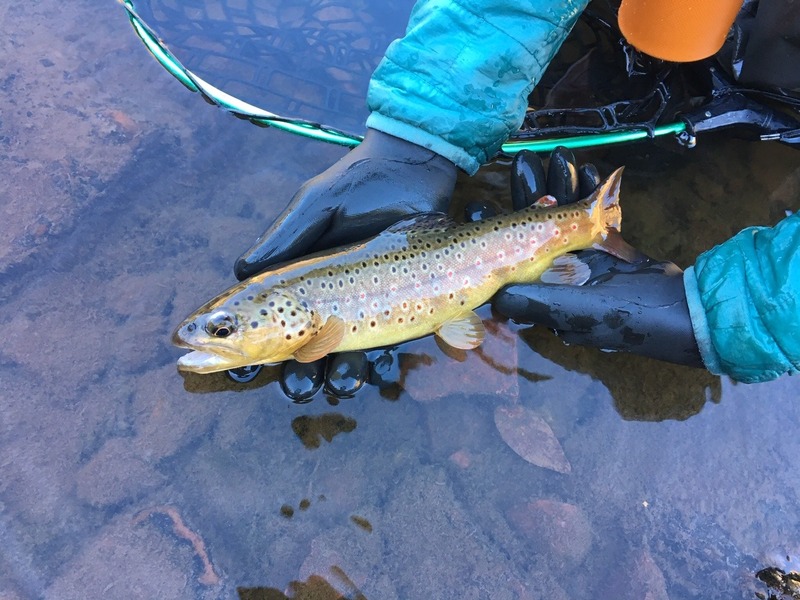 In the summer, we tend to get a good mix of browns and rainbows, and many of decent size. 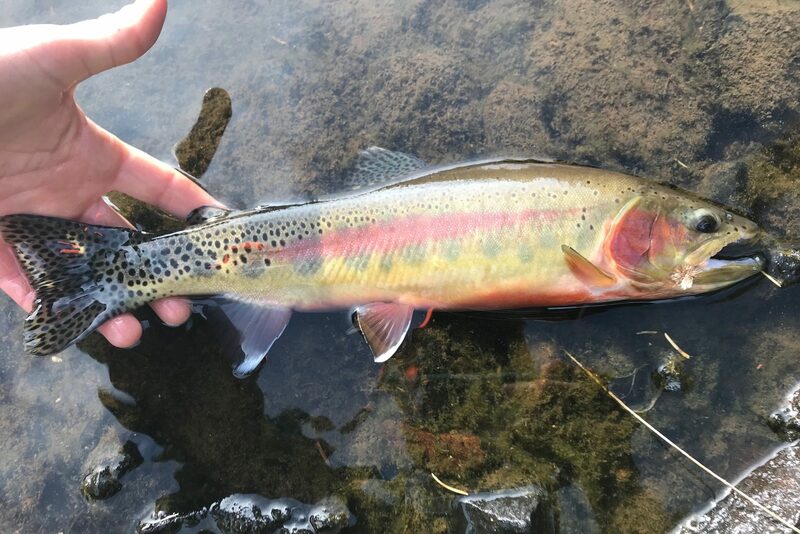 The rainbows here are beautiful, with a thick pink stripe from head to tail. Fish larger than 15-16″ are common, and you can usually spot them and sight fish for them. 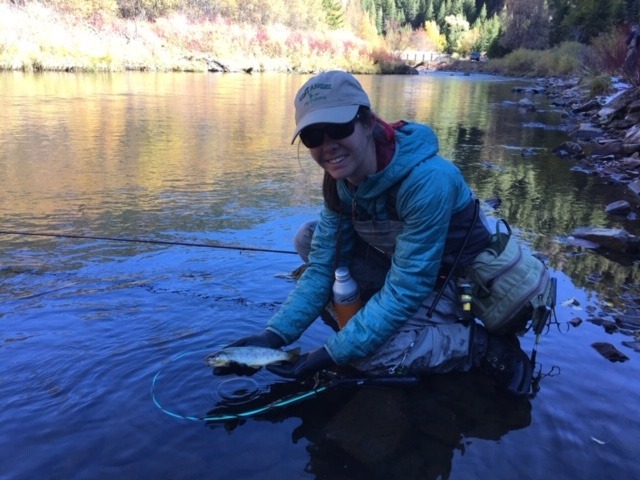 During this October trip, it was mostly small browns and smaller rainbows. 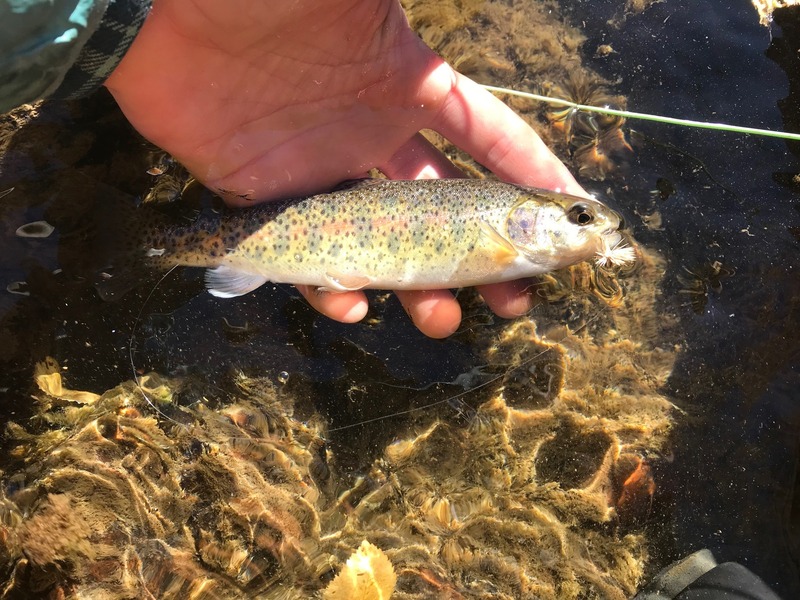 The big browns we caught were 10-12″ and most of the rainbows I saw could fit in the palm of a hand. They still had parr marks and hadn’t yet developed the distinct opaque stripe. The rainbows were small but eager. 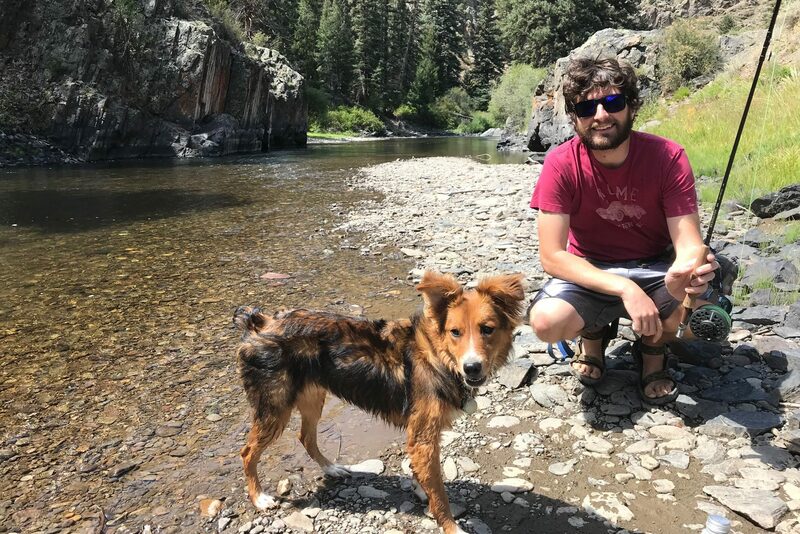 On Sunday, it took a lot to get us out of bed and onto the river. We debated back and forth whether we should get bundled up and brave the weather to try catching a few more fish. Saturday was good, but it wasn’t THAT good. Not good enough to freeze your fingers, risk falling in frigid water, or worry about ice on your guides. Luckily for us, we decided to give it a try. And it was worth it. I brought two rods to the river: one with a streamer and one with my dries from the day before. I thought the streamer might be necessary, figuring with the cloudy skies and cold temps, it might take some heavy machinery to entice a strike. I decided to try the dries first, just to see if I could rule them out. But I couldn’t. First cast, I had a fish. It was going to be a good day. As the snowflakes fell, the fish couldn’t get enough. Every pocket produced fish. Some produced multiple. I lost feeling in my fingers, but kept at it as long as I could before I couldn’t work the line anymore. What we had almost chalked up to a lost day turned out to be one of the most productive days of the year. As we got ready to leave, we found one last tiny pumpkin in the trunk of the car. We left it at that spot, as a thanks for making it a snow day to remember.